A key factor in understanding the transition of the real-estate markets in cities of Eastern Europe and the former Soviet Union hinges on the transition from state to private ownership. Buildings, commercial centers, homes, and even vacant lots suddenly become prime targets for real-estate speculation and foreign investment. During the Cold War, small amounts of private property or, at least private employment, existed in Eastern Europe and the former Soviet Union (Szelenyi 1983). There was also a pool of entrepreneurs who have become increasingly important as a bridge between the impending global market on the outside, and newly emerging democracies and markets from within. In Cuba, however, the loosening of state controls over a centrally-planned economy unfolds cautiously, and with joint-venture operations. Unlike its former socialist trading partners, Cuba held practically an insignificant amount of private entrepreneurs until recently (Pérez-López 1995). The demise of the socialist trading bloc (Council for Mutual Economic Assistance, CMEA) has brought a growing number of foreign investors to Cuba, all of whom require locations for the new operations. The district of Miramar in Havana affords amenities and some infrastructure that accommodates these new headquarters. By locating in Miramar, new questions and concerns arise about the use of public and semi-private spaces in contemporary Cuba. This paper examines the changing use of these spaces. It begins with a brief review of the residential changes that Miramar has experienced in the past 50 years or so. 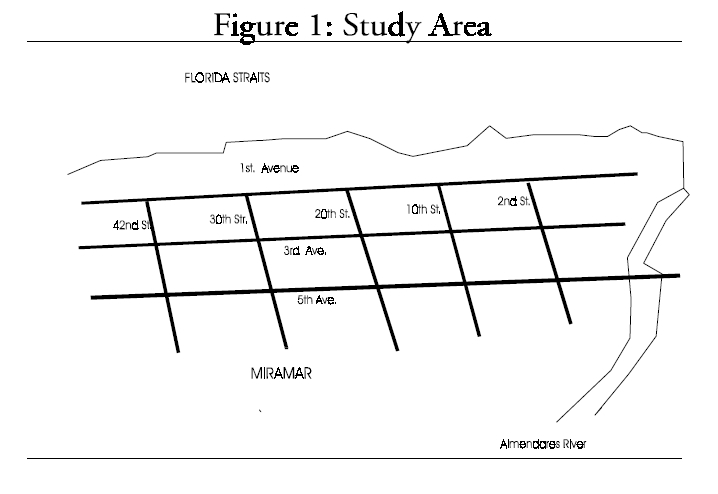 I then summarize a land-use study I conducted in June 1996 on the location of foreign and joint-venture firms that have offices or retail outlets in roughly a 60-block area of oceanfront property in Miramar. This inventory of foreign investment includes the following streets: it is bounded east-west by 2nd and 60th streets, respectively; they run north-south and are perpendicular to the Florida Straits. It is outlined north-south by the ocean and extends to Fifth Avenue Quinta Avenida (running east-west, parallel to the Florida Straits) (Figure 1). The approach in this land-use survey is largely empirical, providing a ‘snapshot’ only of those firms vying for the choicest locations and, supposedly, paying greater rent to the Cuban government. Accordingly, these land uses are surrogate measures of potentially profitable investment areas, or at least those areas deemed appropriate for investment by the Castro government. A defining feature of Havana’s urban geography is the wandering trek of its center-city and economic and political functions. In the parlance of urban geographers, these functional nodes or downtowns reflect the economic, political, residential, and symbolic elements of a given city. Since its founding in 1519 until the mid-19th century, Havana was a walled city. Three main town squares anchored the ovalshaped core of Old Havana: Plaza de la Catedral, Plaza de Armas, and Plaza Vieja. By the early 19th century, the old walls had clearly failed to contain urban growth. Neighborhoods to the south (Cerro, Jesús María) and west (Centro Habana, Vedado) opened up to house new businesses and upper-income homes. By the turn of this century, Centro Habana functioned as the commercial locus of the city’s economy. During U.S. occupation from 1898-1902, the Army Corps of Engineers modernized Havana’s infrastructure. The Americans improved roads, telegraph and telephone lines, port facilities, and sewers. A major contribution to the city’s transportation network included the extension and widening of the Malecón— Havana’s seaside promenade— westward, from its beginning at the Prado. The construction of the Hotel Nacional at what is now La Rampa district of Vedado, anchored what was then the end of the Malecón, about 3 kilometers from Habana Vieja. During the latter 19th and early 20th century, Vedado grew as a center of middleand upper-income residences. Miramar remained fairly isolated from Havana’s push westward. Separated from Vedado by the Almendares River, the area was accessible only south of the waterfront, over higher land. In the mid-1920s, engineers bridged the Almendares. This facilitated the opening up of Miramar as an attractive, bedroom community. Designed in the spirit of the City Beautiful movement in the United States (characterized by landscaped boulevards and town squares), automobile access capitalized on this level, oceanfront suburb of Havana. By the late 1940s and early 1950s, the Malecón had been extended some 8 kilometers, reaching the Almendares River. At that time, a French-Cuban venture completed a tunnel under Havana Bay as well as under the Almendares River. In 1957, a tunnel joined Línea Street in Vedado and Quinta Avenida in Miramar. Commuting time for Havana’s merchants who worked in one of the downtown areas (Vedado, Centro Habana, or Habana Vieja) had been greatly enhanced by the tunnel. One could now travel in about 20 minutes from the center of Miramar, along the Malecón, to Parque Central at the end of the Prado. The Revolution of 1959 ended that pattern of suburban commuting but it did not immediately change the ‘look’ of Miramar. By the late 1950s, Miramar had come to hold a huge stock of solid homes, most of which were modest in design and scope, although many were palatial. Some of the Caribbean’s finest Art Nouveau, Art Deco, and Modern designs can be found in Miramar. A large out-migration of Cubans in the early years of the Revolution left many vacancies. In the early 1960s, the revolutionary government used these empty houses as student boarding houses, as well as lodging for foreign technicians and advisors and dirigentes from the revolutionary leadership. Throughout the 1970s and 1980s, the number of protocol houses (casas de protocolo), government ministries, foreign embassies, and houses for Cuban Communist Party officials increased in Miramar. With the onset of the Special Period in the early 1990s, foreign investors were aggressively courted. Their charge was to help arrest the downward spiral in which Cuba found itself after trade and aid from the former Soviet Union ended (Carranza, Gutiérrez and Monreal 1995). Miramar, as it had done in the past, positioned itself to accommodate this new demand for prime real estate. I conducted a land-use survey of commercial establishments as noted by the presence of a sign on the property. I conducted the survey over a two week period in June 1996. The reconnaissance covered approximately 60 city-blocks. When I had a question about the nature of the commercial enterprise, I inquired directly at the office or with neighbors or workers. I recorded about 120 non-residential establishments, of which 92 had a clear commercial focus. 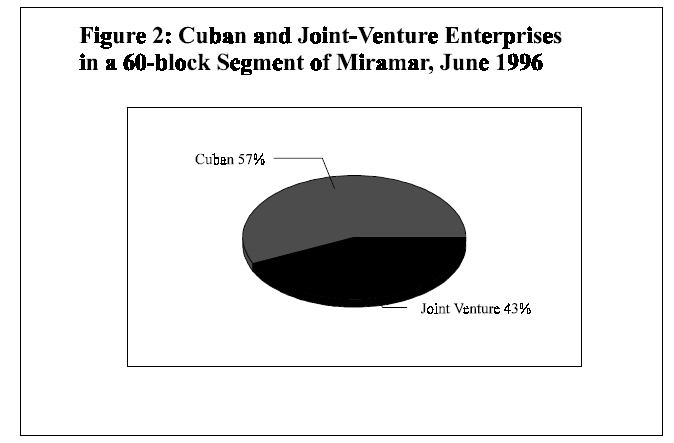 Slightly more than half (57 percent) of the seemingly com-mercial establishments were Cuban entities (Figure 2). Most of these Cuban firms work in the area of tourism or in other services (advertising, telecommunications, office furniture, interior design, laundry and dry-cleaning). A second concentration of Cu- ban-owned firms was hard-currency charging retailers: film developing, jewelers, restaurants, and beauty salons. The majority of those Cuban firms worked in the service sector: import-export, tourism, and restaurants. 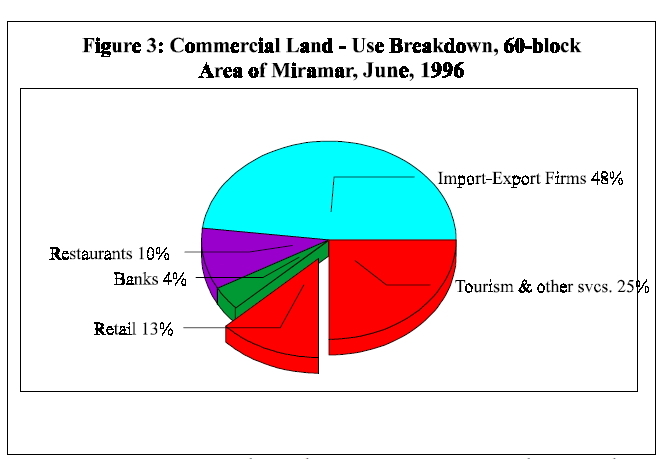 Figure 3 displays the commercial land-use breakdown of the 60-block area of Miramar under study. The data refer to both Cuban and foreign (joint-venture) commercial establishments. Leading land uses in descending order are import-export firms, tourism and other services, retail, restaurants, and banks. Forty-three percent of the commercial firms were foreign (joint-ventures). I determined by the signs posted that there were investors from Spain, Mexico, Canada, Bermuda, Italy, Panama, Japan, and China. Almost all of the joint-venture firms concentrated on imports-exports. There was also a strong presence of foreign embassies (n=15), but I did not include them in this survey of commercial enterprises. If included, however, they would shift the land uses of commercial buildings in Miramar to about half Cuban and half joint-venture businesses. Along with the great majority (>90 percent) of buildings in Miramar that remain residential, there are a few non-commercial Cuban activities in the study area. One clinic, two schools, several churches, government offices, two museums, and an indeterminate amount of mom-and-pop restaurants (paladares) operate in the area (Scarpaci 1995). 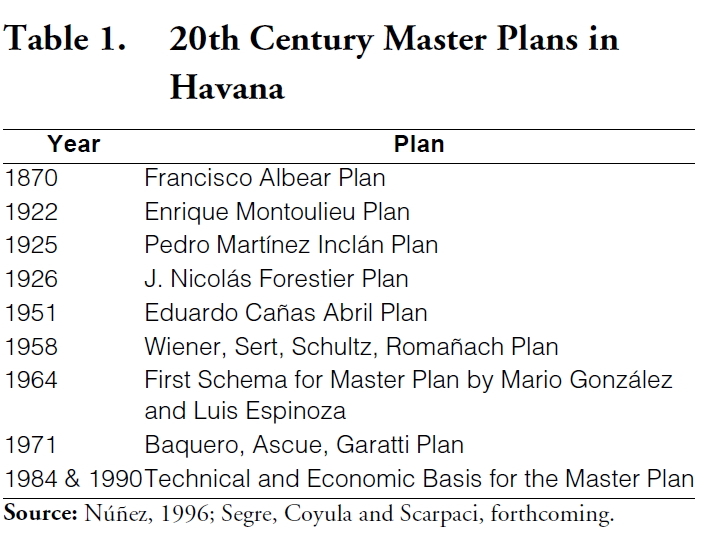 Land-use planning and regulation in 20th century Havana has been shaped largely by master plans (Table 1). Most of these plans represented broadly sketched and normative features of the city; they presented idealistic views of how residential, commercial, industrial, and other spaces should be allocated throughout Havana. However, they lacked a comprehensive approach to deal with urban problems. Instead, “the role of zoning concepts in these ‘plans’ was very strong” (Núñez 1996, 6). After 1959, the Revolutionary leadership nationalized about 90 percent of land in Cuba, while in Havana, about 70 percent came under state control. Along with the elimination of what was perceived to be widespread corruption and speculation, so too disappeared any semblance of a real-estate market (Hamberg 1994). Conceptual concerns of equity and social justice outweighed matters of efficiency. The government set rent at 5-10 percent of gross incomes. Commercial space was leased at ridiculously low prices. The strategy also sought to improve the home-work ratio (i.e., clustering homes close to the workplace). With the onset of the Special Period and the need to accommodate foreign investment, Havana’s land market began changing. In the early 1990s, only a few activities financed by foreign capital were permitted (tourism, textiles, trading operations). In September 1995, the Cuban Parliament passed the Foreign Investment Law which broadened the scope of investment. In essence, land will still remain property of the state, but terms of lease will reflect the necessary periods of time for the foreign investor to recoup an investment and earn a profit. Put another way, real-estate laws in Havana address tenancy, not property rights. The impact of this law in Havana— especially in Miramar and other ‘choice’ locations — is both profound and confusing. On the one hand, the government began reneging on its post-1959 commitment to satisfy housing demands. Instead, it began searching for hard currency. How can the government, for instance, justify investing heavily in repairing buildings designated for joint-venture operations when, right across the street, there is an overcrowded home in dire need of repair? Although public discourse on this is constrained, officials justify these actions because of the (i) the economic quagmire of the dissolution of CAME; (ii) the 35 year old U.S. blockade against Cuba; or, more recently, (iii) the looming impact of the Helms-Burton Act on Cuba’s economic future. My conversations with dozens of Miramar residents showed that there is public concern about this new preference for business enterprises at the expense of residential construction needs. On the other hand, confusion surrounds real-estate investment. There is little institutional capacity to handle this new investment. Government agencies have little experience with this economic activity. Because foreign investment must be approved at the highest levels of government, it is paramount that local, mid-level and national government agencies work closely together (Núñez 1995). Staff do not have clear signals about how to handle requests for property renovation or securing material inputs (paint, plaster, electrical wiring, glass) for remodelling. In brief, there is little ‘transparency’ about the norms and regulations surrounding real-estate developments (Núñez 1996, 14). When clarity or approv al for a real-estate deal is reached, it usually violates the prevailing master plan. The over-centralization in the decision-making process, the strong sectoral approach in the economic behavior, the narrow concepts to measure the development agencies’ performance, the lack of integrity in the implementation process and the over-estimation of the scale[,] are the causes of high cost urban development [in Havana]. The Grupo para el Desarrollo Integral de la Capital held a symposium to address this changing real-estate market in May 1996. The conference was held in Miramar and was titled, Havana on the Eve of the New Millennium: Challenges and Opportunities. 1 It included some 30 Cuban and foreign experts and potential investors. The sponsor’s goal was to “ensure that any land investments are made in an orderly fashion and that they will develop areas in need of an injection of foreign capital but will not change the flavor of the lovely city” (RHC 1996). The challenges, to which we turn in the next section, are not small. The amenities of Miramar continue despite changes in land use over the past 37 years. It is still one the thickest, tree-covered sections of the city. Third Avenue, running parallel to the ocean and set back just one block, is a principal bicycle thoroughfare. It eases the flow of some of the city’s 1 million bicycles (about one for every two habaneros) (Scarpaci and Hall, 1995). Prestigious Quinta Avenida still retains its neatly landscaped pedestrian mall in the middle, and is flanked on both sides by two-lane, unidirectional roads. Because of the risks of car bombs and attempts against Fidel Castro’s life, automobiles cannot be parked on Fifth Avenue, nor can buses or private trucks pass through it. Quinta Avenida is now sprouting more commercial establishment headquarters for joint-venture operations, as well as its longstanding endowment of embassies and diplomatic residences. Several phases characterize street life in the 1990s. At the beginning of the Special Period (1990-1993), few cars passed through the streets because of strict gas rationing. Blackouts prevailed and travel on the roads at night was often unsafe. The liberalization and decriminalization of the dollar in 1993 brought a greater number of small entrepreneurs to the neighborhood. Home restaurants (paladares), bicycle repair shops and parking lots, refreshment and snack stands, and other activities began changing the look of driveways, porches, back garages, and property fronts. Since 1994, a flurry of remodeling has taken hold. Financed mainly by Cuban and joint-venture firms, these activities refurbish the large homes that once held students who came from the provinces to study in the capital, or many migrants from the eastern provinces. Construction efforts remodel these homes to furnish businesses with office space, sales rooms, dining areas, and apartments for foreigners. Unlike any time in the history of the Revolution, Miramar displays a collection of ‘haves’ and ‘have nots’ that are distinguished by their access to dollars, an unprecedented situation in Socialist Cuba. The out-migration of a large bourgeoisie left a huge housing stock in Miramar and adjacent districts for the revolutionary government to use. Government leaders took pride in promoting the new social integration taking place in this corner of the city. Soldiers, literacy campaign volunteers, students, and government officials were often rewarded with homes or apartments in this coveted section of Havana. If any section of the city represented a radical transformation, it was Miramar. Class, race, and occupational skills mattered little when it came to assigning housing. Since the foreign investment ‘boom’ of the 1990s, Miramar is again becoming a highly segregated social space. Not only is there a growing number of foreigners there, but the area is heavily patrolled by Tourist Police and regular police. When power blackouts strike, the roars of gasoline engines that serve as power backups identify which buildings are foreign owned. The contrast between the illuminated and freshly painted foreign structures next to the darkened homes of Miramar residents— patiently waiting on their porches or front steps for power to return— is a strong reminder of the new segregation taking hold. The contrast of Miramar with the broader structural changes sweeping Cuba is perhaps best illustrated by the motto of a foreign tourist company posted on Quinta Avenida: “The Ultra, Inclusive, Exclusive Resort.” To be sure, Miramar is paradoxically both inclusive and exclusive. In just a few years, the rental market development and property renovations of Havana have taken place at unprecedented levels. This new investment is not directed towards the traditional socialist thrust of providing new housing. Instead, it is designed to attract and retain overseas investors. While the State still maintains ownership of these new rental properties, foreign investment is leaving its stamp on the cityscape. The residential amenities of Miramar hold great appeal for these new economic actors. In the process of providing the necessary office space and homes, however, a new rift has appeared in the social fabric of the city. Miramar is quickly becoming a highly segregated place with distinct zones of exclusivity. While the district has been home to many embassies during the course of the Revolution (and therefore has always been a special place for foreigners), the presence of multinational and Cuban companies is creating a new look. This paper reported on the commercial land uses of more than 100 buildings in a 60-block area next to the ocean. Although 57 percent of these commercial complexes are Cuban, the breakdown is about half foreign and half Cuba once foreign embassies and their residences are included. About half of the foreign establishments (47 percent) serve as headquarters for import-export firms. As Cuba tries to reassert insert itself into a global economy, this land-use survey should serve as a benchmark for subsequent changes in Helms-Burton legislation, the ongoing U.S. trade embargo, and the real success Cuba will have in attracting foreign investment. Future research should address the growth and expansion of this new commercial real estate. It will also be helpful to know how residents of Miramar feel about the subtle and overt changes in their buildings and streets. Carranza, J., Gutiérrez, L., and Monreal, P. 1995. Cuba: La Restructuración de la Economía. Una Propuesta para el Debate. La Habana: Editorial de Ciencias Sociales. Hamberg, J. 1994. The Dynamics of Cuban Housing Policy. Unpublished Ph.D. dissertation, Columbia University, New York. Núñez, R. 1995. The Influences of Government Relations and Institutional Environment on Urban Issues in Cuba. La Habana: Grupo para el Desarrollo Integral de la Capital.
. 1996. Land Planning and Development in Havana City: Two Study Cases. The New Investment Context Regarding Land. La Habana: Grupo para el Desarrollo Integral de la Capital. Pérez-López, J. 1995. Cuba’s Second Economy. New Brunswick, NJ: Transaction Books. RHC. 1996. Workshop on real estate and urbanism underway in Havana. From Radio Havana (via the Internet) (June), 2 pp. Scarpaci, J. 1995. “Havana’s Emerging Food and Agricultural Markets.” In Cuba In Transition— Volume 5. Washington, DC: Association for the Study of the Cuban Economy. Scarpaci, J., and Hall, A. 1995. “Cycling through Havana.” Transport Development. No. 5 (Fall), pp. 2-4. (New York: Institute for Transportation and Development Policy). Segre, R., Coyula, M., and Scarpaci, J. forthcoming. Havana: Two Faces of the Antillean Metropolis. New York and London: John Wiley & Sons. Szelenyi, I. 1983. Urban Inequalities under State Socialism. London: Oxford.